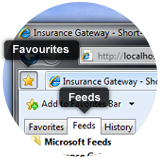 Please note the feeds below are for the Investment Professionals Gateway only. Below is a sample of the RSS Feed for the Investment Professionals Press Room. A policy reserve computed by a method that makes no allowance for higher first-year expenses. A uniform portion of each year’s premiums paid by the insured is used for reserve purposes. Comes into play in the calculation of in-force premiums where there are cancellations or endorsements part-way through the policy term.